If luxury, an unparalleled amenity package and a fabulous location is what you are looking for, a stay at Westgate Resort will undoubtedly fit the bill. Located slope side at Canyons Resort, access to skiing, hiking and biking is at your doorstep. 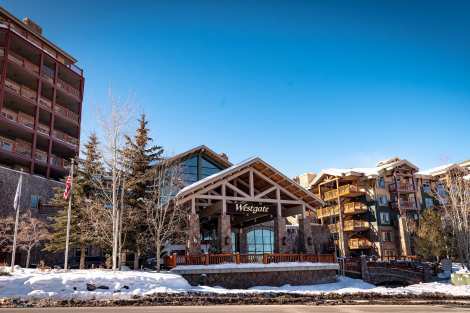 Westgate boasts the benefits of a world class resort, all within a ten minute drive to Main Street I Park City. Each of the four bedrooms has their own en suite bathroom, and each bedroom is its own luxury suite on to itself. The amenities are truly unbelievable with seven flat screen TV’s, three stone fireplaces, three private decks with panoramic views, two full refrigerators and a ten guest dining room table. An entertainers dream or perfect for families traveling together. A private hot tub is on one of the decks, while a common area hot tub and swimming pool is available within the resort confines. Free shuttles are available to whisk you in to Park City should you choose to venture out of the Canyons area. A complimentary ski valet is on-site and makes getting and returning your gear a snap. On the fourth floor you’ll find a state-of-the-art fitness center should you require additional activity besides your mountain adventures. An indoor heated pool is for adults only and has a spectacular water feature. Visit in any season and take advantage of golf in the summer and skiing in the winter at this outdoor enthusiast retreat.